The fake news media is now targeting random supporters of President Trump on behalf of far-left, antifa Twitter mobs for advocating the United States protect its borders. 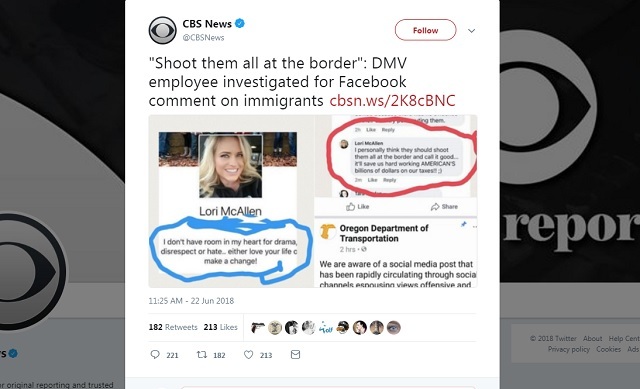 CBS, which is owned by billionaire Sumner Redstone and run by CEO Leslie Moonves, ran an article Thursday targeting a DMV employee in Oregon for saying she supports the US using violent force if necessary to defend its borders. 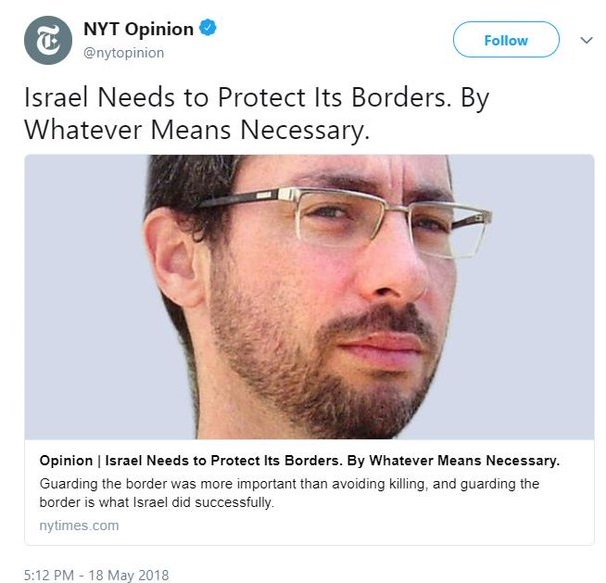 The exact same opinion was shared prominently in The New York Times last month after Israel killed some 60 Palestinians and injured over 1300 on its border with little fanfare. The Oregonian first published the leftist mob's dox and shared details about where the woman lives and how much she earns. An Oregon woman who works at the DMV has come under fire for comments she purportedly made on Facebook. Lori McAllen's Facebook page is currently untraceable, but a screenshot of the comment has been widely shared online. It says she thinks immigrants crossing into the U.S. should get shot at the border. In her bio on Facebook, McAllen wrote, "I don't have room in my heart for drama, disrespect or hate." But she seemed to have a very different attitude when discussing immigration policy in the comments section of a Facebook post. "I personally think they should shoot them all at the border and call it good... it'll save us hard working AMERICAN'S billions of dollars on our taxes!!" she wrote. She ended the remark with a winking emoticon. [...]Oregon DOT sent out a tweet about the situation Thursday, saying: "An employee linked to an offensive Facebook post is on leave while we investigate. We take this matter very seriously and very personally. The comment doesn't reflect our agency values and is disturbing and hurtful. Thank you for your patience as we complete the investigation." [...]In his phone call with CBS News, Thomson reiterated that sentiment. "We are offended and hurt by such a post -- no matter who made it -- that does not reflect the values of the people who work here," he said. Thompson also said the department had decided to put McAllen on administrative leave until the investigation is complete and an decision is made. McAllen has worked at the Department of Motor Vechicles division of the DOT for 10 months, Thompson said. She was hired as a DMV clerk. Advocating for strong border enforcement is not a crime. McAllen needs to file suit immediately. 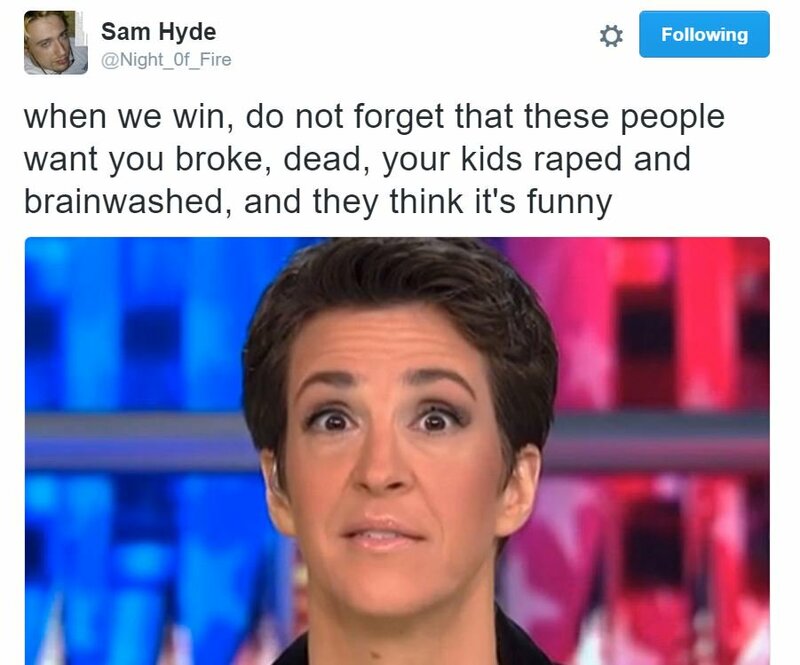 Destroying people’s lives is not journalism. You’re attacking people you disagree with, it’s not protected speech. Why is this news? Why is a national news agency in the business of doxxing random people for posting edgy opinions on facebook? “We can no longer say Trump’s the bad guy. If you vote for Trump, you’re the bad guy," Deutsch said on "Morning Joe." "If you vote for Trump, you are ripping children from parents’ arms,” he added. "“What the Democrats have to do is make the next election a referendum on not who Trump is, but who you are." “If you vote for Trump then you, the voter, you, not Donald Trump, are standing at the border, like Nazis, going ‘you here, you here,'” Deutsch said. This is exactly what they're doing. This is what they want for every Trump supporter and every person who loves America.